I was brought up in a good Christian family, with parents who loved The Lord, while also loving us 3 kids with an undeniable love. As long as I can remember, my parents were always heavily involved in our local church. My mum and dad both played integral parts in the leadership, dad frequently preached, was the church secretary and then became an elder! My mum taught Sunday School, led worship, was the Church organist and they were both involved in numerous other activities. We went to Church twice every Sunday and our home was continually filled with people from our church coming to meetings and small groups. We were entrenched with a solid Church life. Sleeping Rough Through a Polar Vortex! When the "polar vortex" hit Chicago this past winter, I had wished it was my time to relax and sit around a nice warm fire with a good book! Unfortunately, that was just not the case! As wave after wave of this "polar vortex" slammed good old Chiberia (the new nickname Chicago received this winter), things became a lot more serious for me! This was not because icy piles of snow, record-breaking freezing temperatures and face-burning wind chills can be extremely aggravating and painful, but rather, it's the realization that these insanely low temperatures and the endless plummeting of snow meant that life and death rested in my feeble hands. 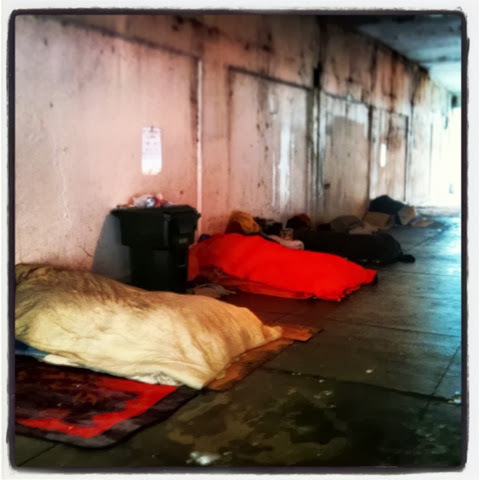 This last comment may sound like an exaggeration, but it's not; the chronically homeless population is one of our modern day society's most vulnerable, as they don't have as many options to escape our winter's harsh and brutal elements!